Sri Lanka may be undertaking a change of course towards accountability for atrocities committed during its 26-year civil war. The new government promised to establish a truth commission and co-sponsored a UN resolution calling for international involvement in a domestic tribunal. At the same time, a commission of inquiry initiated by the previous government issued a report which – in a first such case for an official national body – acknowledged that allegations of crimes committed by government forces during the bloody final phase of the conflict are credible. Momentum seems to be building, but it remains to be seen whether Sri Lanka’s government will follow through on its promises. As many as 100,000 people were killed during Sri Lanka’s civil war, which saw the Liberation Tigers of Tamil Eelam (LTTE or Tamil Tigers) fight against government forces for an independent state for ethnic Tamils who historically suffered from discrimination by the majority Sinhalese. Both sides allegedly committed war crimes and crimes against humanity, including murdering civilians, summary executions, and enforced disappearances. The conflict ended in 2009, when the Sri Lankan military defeated the Tamil Tigers after a major offensive marked by heavy civilian casualties. 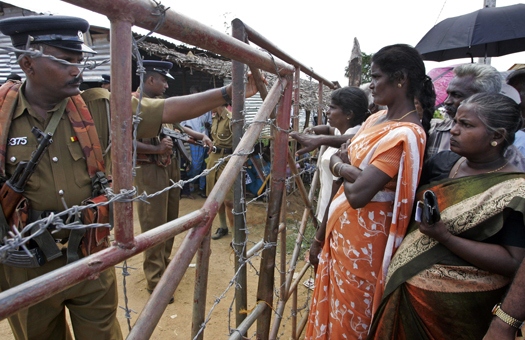 The government claimed to establish a small “safe zone,” for civilians, but many Tamils were prevented from reaching it by the LTTE, and the zone was later attacked repeatedly by the military. By some estimates, as many as 40,000 civilians were killed and 300,000 displaced during the war’s final stages. The displaced were forcibly relocated to internment camps against their will. To understand the significance of the government’s recent promises and the challenges it will face in implementing them, it is necessary to look back on earlier attempts at documenting abuses, the previous government’s attempts to whitewash the past, and the latest developments in the country and the international arena. In trying to get the full picture, we spoke with three Sri Lankan activists who are involved in the struggle for victims’ rights and justice in Sri Lanka to get a view from the ground. Under former President Mahinda Rajapaksa, the Sri Lankan government denied responsibility for any crimes committed during the civil war and refused to cooperate with international inquiries. In 2010, UN Secretary-General Ban Ki-Moon tasked a panel of experts to investigate alleged abuses committed during the bloody end of the civil war. Working without the cooperation of the Sri Lankan government, the panel found credible allegations that the armed forces killed civilians through indiscriminate, widespread shelling and the denial of humanitarian aid. It also found credible allegations that the LTTE committed abuses and killed civilians. The Rajapaksa government rejected the panel’s report, having earlier established its own Lessons Learnt and Reconciliation Commission (LLRC) to examine the causes of the war. The LLRC concluded that although civilians were killed, government forces did not deliberately target them. The commission was roundly criticized by human rights groups and the UN for lacking independence, among other faults. Other commissions of inquiry were also created by the government, including a commission on the disappeared, but little came of them, creating a sense of disillusionment and cynicism among victims. At the same time, the government restricted the ability of civil society groups and activists to call for justice and accountability. Niran Anketell is a Sri Lankan lawyer and co-founder of the South Asian Center for Legal Studies. An ethnic Tamil, Anketell says that even talking about transitional justice was dangerous at the conclusion of the civil war. In the time after the fighting ended, dozens of political activists and journalists reporting on human rights and war crimes allegations were killed or disappeared, taken by men in mysterious white vans. In those days, Anketell’s organization operated covertly, publishing documents under pseudonyms and in foreign countries. With the election of Maithripala Sirisena in January 2015, all that changed. “There was a general easing of space for civil society work across the board,” says Anketell. The new administration promised accountability and began engaging with the international community. Days before the release of a long-delayed UN report on the civil war in September 2015, the Sri Lankan government laid out the broad strokes of its own plan to pursue justice by establishing a truth and reconciliation commission. The government also pledged to create a mechanism for criminal prosecutions and to provide reparations to victims. More recently, it committed to collaborating with the International Committee of the Red Cross to establish a permanent office for missing persons. When the UN report was eventually released, it called for the creation of a hybrid court to prosecute cases of alleged war crimes, for which there is credible evidence. Far from debating whether crimes had or had not been committed, the debate in Sri Lanka turned to whether justice was best pursued domestically or with international involvement. Shortly after the release of the UN report, the UN Human Rights Council adopted a resolution that addressed a number of key issues, some which were raised in the report. The resolution, which was adopted by consensus and with the support of the Sri Lankan government, calls on the government to create a criminal justice process with participation from foreign judges, investigators, and prosecutors. It also calls (though not explicitly) for the creation of a special prosecutor’s office and the passage of a law on international crimes, in addition to the establishment of a truth commission and a special mechanism for enforced disappearances. In Sri Lanka, the adoption of the resolution was greeted with cautious optimism by activists like Sanjana Hattotuwa, the founder of Sri Lanka’s first citizen journalism website, Groundviews. “It sets up mechanisms through which accountability can be pursued if the government is serious about it, and at this point of time, is a significant step towards ascertaining what has remained hidden since the end of the war, and around the longer duration of the war,” says Hattotuwa. Sri Lanka’s support of the Human Rights Council resolution can be viewed as an important step for the new government’s declared commitment to justice. But whether the government acts on its commitments is another story. There are myriad obstacles in its way. One such obstacle, say activists, is capacity – both in the judicial system and in the government. And while Anketell says Sri Lanka has a sophisticated and robust legal system with functioning courts, he cautions that it lacks core competencies regarding the investigation and prosecution of international crimes, as well as witness protection. Sri Lanka also lacks laws criminalizing international crimes, such as crimes against humanity and war crimes. Without such legislation, abuses committed during the civil war could only be tried as “ordinary” crimes. “There need to be new laws, effective protection mechanisms, security sector reforms, involvement of victims and civil society in the design of new processes, among others to ensure processes are credible,” says Bhavani Fonseka, a Sri Lankan lawyer and senior researcher for the Centre for Policy Alternatives. Implementation will also mean overcoming stiff political opposition. With a history of colonization—the country changed hands from the Portuguese to the Dutch to the British before achieving independence—and close proximity to India, which became involved in the civil war during the 1980s, Sri Lanka is protective of its sovereignty. Because of this history, the issue of international involvement in a potential criminal tribunal is particularly thorny. Fonseka stresses that while international participation is crucial to making a credible justice process, it must be owned by Sri Lankans. “Hybrid does not mean international actors taking over the process, but instead supporting Sri Lankans taking this important step to move justice and accountability forward,” says Fonseka. According to Hattotuwa, there is much opposition to a justice mechanism in Sri Lanka’s mostly Sinhalese south. Fonseka notes that some Sri Lankans still deny that crimes even occurred. The Sri Lankan opposition recently called for a national referendum on the creation of a hybrid court, arguing that the government should not be able to make the decision on its own. Former President Rajapaksa said that during his time in office he considered a hybrid tribunal to be politically unacceptable and at odds with the Sri Lankan constitution. Hattotuwa sees some reason for optimism after the adoption of the UN resolution. He says that in Sri Lanka’s mostly Sinhalese south, which has opposed efforts to establish justice mechanisms and whose support is needed for any accountability measures to move forward, the government’s involvement in the adoption of the resolution was seen as a sign that it “protected the country from more invasive, disruptive moves to set up an international investigation.” In that respect, the resolution pushed the boundaries of what the government can achieve. He points to a worrying pattern of government officials saying one thing to international audiences, but another at home. The Sri Lankan prime minister recently said that national unity and reconciliation should be prioritized over accountability, a refrain frequently heard during the Rajapaksa administration. A failure to act on its stated commitments could have dangerous effects on Sri Lanka’s transitional justice process. These thoughts are echoed by Hattotuwa, who cautions that the government must not only follow through by establishing the mechanisms recommended by the UN resolution, but must also provide support throughout the transitional process and resist pressures to obstruct investigations that are politically inconvenient. If the government can overcome the challenges it faces and resist political pressures to water down its approach, that will be a true break with the policies of the past and a decisive move towards lasting peace that gives victims good reason to believe that justice will be done.